At the 'Killie Konvention' auction we were pleased to acquire a pair of Sturisoma catfish. The bag was labelled Sturisoma aureum and there is no serious doubt about the Sturisoma part. As you shall see we have reasons to wonder about whether they are really aureum. For some time we have watched a breeding pair of Royal Twig Catfish, as the Sturisoma aureum are sometimes called, in a display tank at the Henley Pet Centre in St. Catharines. (By the way they spawn frequently but the babies seem to be quite difficult to raise.) These beauties are almost twice the size of our specimens so we figured we might have a long wait before any breeding was likely to happen. Our Sturisoma pair were made comfortable in a twenty-five gallon tank with a couple of box filters, some greenery and a piece of wood. The tank was also inhabited by a school of Lemon Tetras and two female Corydoras aeneus. They were fed mainly crushed green beans and a little spirulina flake. We softened the water slightly by adding a bit of RO (Reverse Osmosis) water with each partial change. The only exciting thing that happened in that tank during the next couple of months was that we discovered two baby Lemon Tetras in the greenery and removed the adults in order to attempt a spawning. Perhaps they were inspired by the Full Moon. Late on the evening of Friday the 14th of November when I went down to check for the presence of babies in the tetra spawning tank I noticed a rather remarkable display of Sturisoma calisthenics. The female who is somewhat smaller than the male and doesn't have a fringe of bristles on her cheeks was "standing" perfectly straight up and down on the male's head against the glass. I decided on the spot that such a performance was worth an extra bean and proceeded to pop one into the tank. The lights were turned off and I thought no more about it until Saturday morning. The male, now by himself, had assumed an unusual position on the glass. A closer examination revealed that he was tending a clutch of about 35 rather large eggs. The eggswere approx. 3 mm in diameter and appeared clear until you looked closely. Each one had a pale yellow yolk. Hindsight told me clearly that I had missed the spawning sequence and I kicked myself for my stupidity. As it turned out there would be many more opportunities. We removed the rest of the tetras and began partial daily water changes. With timeouts for eating, father did all the egg tending, occasionally warning mother away with a waft of his tail. Over the course of the next five days the eggs turned darker and darker until they appeared to be almost black. 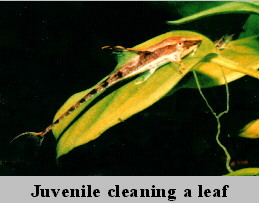 With a magnifying glass the developing baby catfish could be seen shifting positions inside the eggs. On the 21st the first egg hatched. Father appeared to help the process by chewing vigorously at the egg's outer membrane. On the 22nd more hatched and the two Cory cats were quickly removed when they were observed snapping up baby twig cats like children popping gummy bears. By the 23rd, (8 days from spawning), all were hatched and busily searching the bottom and sides of the tank for something suitable to eat. Green beans just don't seem to make it with newly hatched babies and some of them started to die. Some were moved to another algae covered tank where they survived for a while and then died off one by one. An algae covered anubias was placed in the spawning tank and this was cleaned off quite rapidly but less than half of our first spawn survived and we weren't satisfied. After resting for 5 days the Sturisoma pair did it again. This time I got to observe and even take some pictures. As usual the courtship dance took place at night and, conveniently, on the front glass of the tank. The male assumed a position below the female and gradually moved up until he was above her on the glass. All of this was accompanied by much swishing of those long tails. After what seemed like a very long time he moved down beside her and with much mutual quivering she produced two or three eggs from her ovipositor which he instantly fertilized. The process continued until, by morning, he was tending 56 eggs. Eight days later they had all hatched. 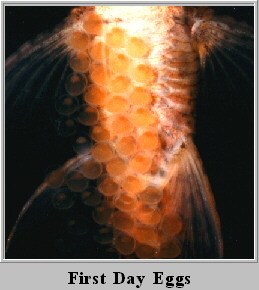 This pattern of spawning roughly every two weeks with spawns averaging between 50 and 70 eggs has continued to the present, (end of February). Our search for a more acceptable baby food led us to an article on the Internet by Adrian R. Tappin <atappin@ecn.net.au> describing success with a mixture of spirulina powder and agar agar. We have been trying this and it seems to be working fairly well. Some babies don't make it but a lot do survive and grow quite rapidly. About 60 of the larger ones have been moved to their own tank where they are doing well and the parent tank is still somewhat crowded. It has been fun but we have begun to wonder if the pair has an off switch. The mystery of which species they may be remains. They have the same attractive arrow shaped pattern pointing back to the dorsal as the aureum and their spawning habits are similar but they are much smaller. Our male measures only about 6 inches in total length whereas the aureum species is known to reach 10 inches. In some ways they better fit the description of the Sturisoma panamense. By the way, Mr. Tappin thinks that aureum and panamense may be the same species but from different locations. This is an interesting suggestion but in addition to the size difference our babies have very little evidence of a yolk sack when they are hatched and he describes the aureum babies as hanging around the hatching site until their yolk sacks have been absorbed. Until we can get some expert confirmation we will continue to call them Sturisoma species or Twig Cats and we highly recommend these peaceful, interesting creatures to anyone who appreciates catfish. NOTE: If you find a tank in a pet store listing Royal Farlowella, check carefully. For reasons I can't fathom, the genus Farlowella is sometimes used as a common name for the genus Sturisoma. If the fish in the tank have long beak-like protuberances (noses) and no cheek bristles, they likely are a Farlowella species. 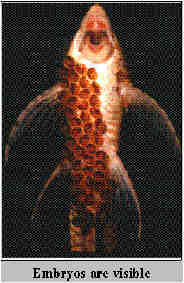 The family Loricariidae includes both genuses plus other armour-plated catfish. Update - September 11, 1998 - a 2nd generation pair of Sturisoma have spawned. They're about nine months old and approx. 4 inches long. Update - Dec. 1, 1999 - these fish may very well turn out to be Sturisomatichthys leightoni, also known as Dwarf Royal Farlowella.